One or two might say a parent. That is fair. Someone will say a Bible class teacher. That is possible but not if it was just Bible class. We don’t walk with people to teach them to follow Jesus. Instead we have turned discipling into evangelistic Bible study. We get them to the water and then presume they will figure it out from there. Are they still attending? Yes. Good…that seems to be enough. But it isn’t enough if you are trying to develop mature disciples. This is why our backdoor is so wide. We don’t lead into conversion from a discipling perspective and it only makes sense that we don’t follow through from there either. Then we lose those we baptize. The New Testament says people in that position are worse off than they were if they never knew (2 Peter 2:21). What do you say to a newly baptized Christian? Do you say, “good luck”? Do you say, “we are here for you”? Then what. Are you there for them and what does that mean to be there for them? Did Jesus ever do that? We don’t find it in the Bible but we (I presume) do it regularly. And somehow this is okay. 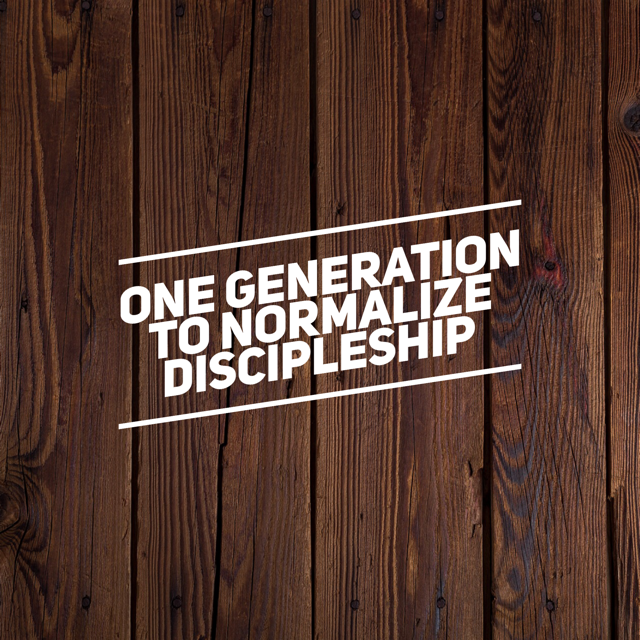 So what would happen if we made discipling normal again? “Again” because this is what they did in the early church. They taught people not just an intellectual agreement with a set of doctrines. They taught doctrine for sure. They also taught how to live the Jesus life. How to walk as Jesus walked. If we are ever going to reverse our decline this is the path and the Holy Spirit is going to have to help us with this just as the Spirit helped the first disciples create a discipling culture. Pray for our churches. Pray we can turn our culture back to discipleship. Then sit down and have a cup of coffee with a young Christian and get to know them. Don’t wait for them to come to you. They won’t. Go to them and start this conversation now. With the Spirit’s help can turn this around if one generation takes this seriously. ← Is the Great Commission for Us Today? So true! My thoughts on for us to do this: we have to change how we think of our time. Instead of planning , we would need to open to being lead. A different way of thinking about my day. I would need to create space to be able to be able to stop and serve instead of planning when I serve. It is a re-pioritization of many things. The church can’t do this for us. We have to do this ourselves. Too often, nothing at all was said to the newly baptized. This is why on Jay Guin’s blog there was a discuss of something like Catholic/Episcopal confirmation class where the younger generation would get some teaching on being a Christian. This is essential. Many of us resist having anything formalized as it looks too much like other groups so we do nothing and the new converts often struggle.